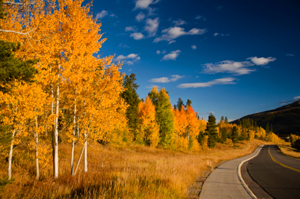 Fall is well underway and it’s a beautiful season to spend quality time in Summit County. So check out the many things you can do in October. You’ll experience the great activities taking place here all month long! Now through October 6th, enjoy delicious drinks from a wide variety of distilleries across Colorado at the Still on the Hill festival. Have a complimentary taste of some amazing brews and craft cocktails. Plus, fine cuisine and bluegrass music are featured in this first of its kind event. Mountain living was one of John Denver’s passions. Now you can hear the music of this unforgettable artist at the Riverwalk Center in Breckenridge. On October 11th at 7:30pm, the award-winning Chris Collins and Boulder Canyon will perform the late singer’s famous and most beloved songs. Fall is a beautiful season for hiking. So don’t miss your chance to join the French Gulch Hike on October 14th at 10:00am. You’ll see the Golden Horseshoe firsthand and tour former mine sites. Make your reservations today! On October 25th from 7:00pm to 11:00pm, get in the mood for some Halloween fun! It’s the first annual Howl-A-Ween Ball costume party at the Silverthorne Pavilion. Characters of all shapes and sizes are welcome (from ages 21 and up) to take part in the dancing, cash bar, costume contest and silent auction. Main Street in Frisco is set to come alive with ghosts, goblins and all sorts of other adorable monsters! From 6:00pm to 8:00pm on October 31st, trick-or-treaters are invited to collect all the candy they can from local businesses. It’s the Trick or Treat on Main Street annual event! Bright orange jack-o-lanterns will lead the way to tasty goodies on Halloween night. Want to Know More October Events? These are just a few of the fantastic things you can do in Summit County throughout October. If you’d like other suggestions, I’d be happy to tell you about other activities you may enjoy. Also, I can help you with any real estate questions you may have about the Summit County region. Whether you want to list your current house or you’re looking to move into a local community, feel free to contact me at your convenience. In addition, I may be able to answer some of your real estate concerns with my Kelli Sells Blog. So if you have a moment, check it out. I update it frequently to make sure you’re always aware of market news and trends in Summit County. Please know you can send me an email at [email protected] or call my office lines whenever you wish. I look forward to hearing from you!